Blaine woke up with a low-grade fever, a runny nose & nasty cough, so... it looks like we are in for a "sick day". He was disappointed because he really wanted to participate in the Cowboy Cookout-party at school scheduled for today. 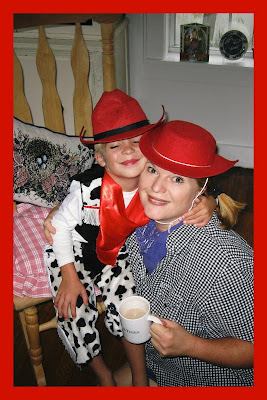 I decided that we would just have our own Cowboy Party here at Blueberry Cottage! At school, the note said they were to have "Pigs in a Blanket", and "Cowboy Coffiee", so we put our heads together and came up with a few ideas. 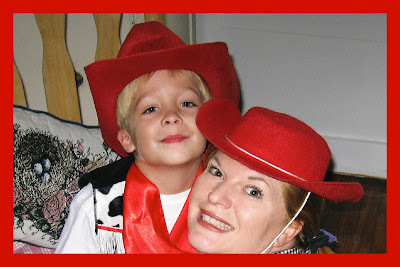 Here we are in the Living Room, it was such a hit that we called Mike from work and he came to join our little Cowboy Celebration (he also took the photos). What a darling Mike is. 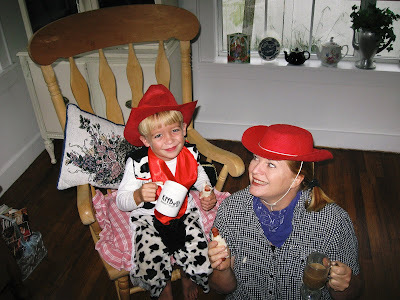 Shortly after this photo was taken, our little cowboy broke out in a fine rash all over, and he asked me (first time in his life, I think) if he could take a little rest in his bed (during daylight hours, I nearly fainted! ).